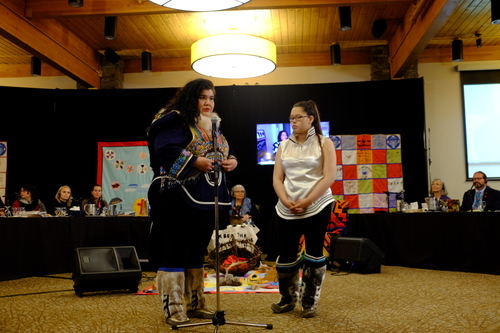 The final day of testimony at hearings for the federal inquiry into missing and murdered Indigenous women and girls in Iqaluit will feature cross examination of a panel focused on decolonizing practices and Indigenous LGBTQ2 people. Garrett Hinchey will be live blogging from the hearing. Incredible beadwork on one of the young throat singers. She says that her mother completed it over seven years, including in the hospital, "to stay strong." She mentions the butterfly pattern. "My mother always said it was amazing that butterflies could live in the Arctic. How resilient are we?" 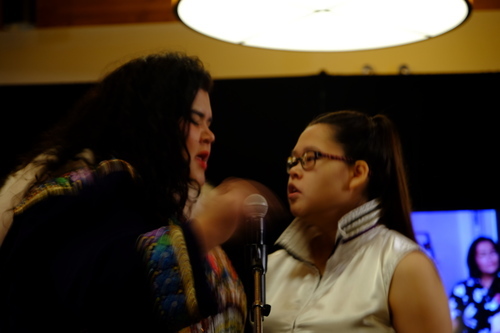 Inuit throat singing evolved over time into a competition between women, she says. The vibrations it creates are also used to rock babies to sleep - babies are carried on the mothers' backs in Inuit culture. It's a really crowd pleasing presentation. Very powerful performance, with a lot of history mixed in, and some levity - they even got the crowd to give it a shot. They are finished now. Biggest ovation of the week. 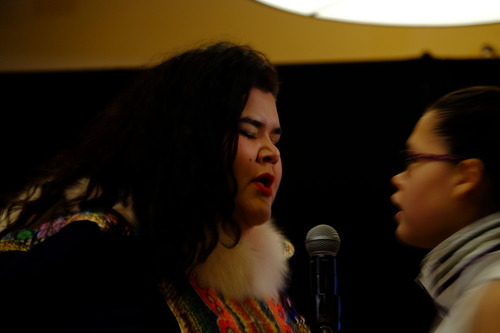 Becky Qilavvaq is the throat singer in the beading. The other one's name is Mary - but unfortunately I didn't catch the last name. 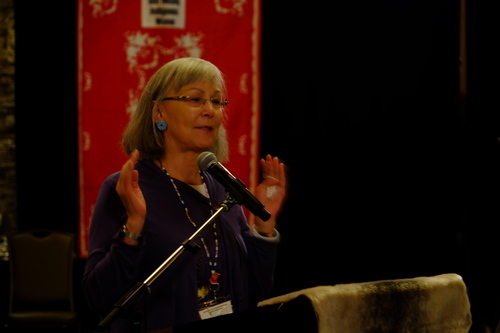 Chief Commissioner Marion Buller is now addressing the room. "I was reminded this week of the importance of storytelling," she says. "And I realized, for the first time, that the national inquiry is one big story." Buller tears up while making her remarks. "We are hearing truths that Canada, and the world, have never heard before." "We don't have all the answers yet, we don't have all the recommendations yet... but when they come, they will be based on truth. Truth that hasn't been told, or if it has, truth that hasn't been heard." "We hope to tell in the end, the greatest story based on truth that we can. That will change the world for the better." "Even if we can't do all that we had hoped to do, the truth is out there. And it can not be denied." "I look forward to seeing you in Quebec City," she says, closing her remarks. Brian Eyolfson will speak next. Eyolfson gives his thanks to everyone in attendance. "I've gotten the chance to get out on the land, I hope you have as well." Qajaq Robinson is now speaking in Inuktitut. It's clearly emotional for her being in her home territory. "We are talking about difficult issues," she says. "It's OK to cry." Robinson surrounded by the other commissioners and her supports now. "Our work is not done. We have to continue to work. And as long as we're surrounded by others, we're able to move forward. This is a very good teaching, and I appreciate it very much." "What I have learnt this week that I think that is of most significance, is for those state actors, governments, whoever they were that came, came with the belief that they had the authority. That they had the right to take it. A belief that was rooted in supremacy. White supremacy, idealogical supremacy. We've heard those impacts. But we've heard about the resilience. And we've heard what we've always know. Indigenous people have the answers, and continue to have those answers. So what do we do? We've heard about space, and I think one of the most important things I've heard this week as a non-Indigenous person, is vacating space that's not yours. There is no longer any reason to justify our existence as Indigenous people. Time's up." Really, really strong words from Robinson. 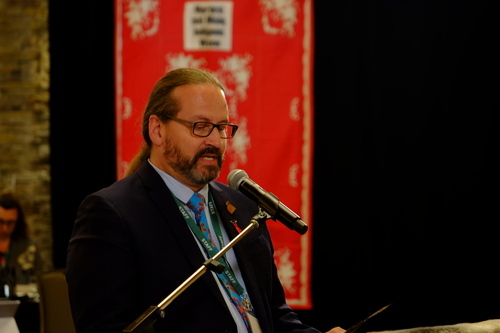 "We know where the problem is and it's not with Indigenous people. It's with those in the halls of power who are not vacating the space. That's all I'm going to say, see you in Quebec City." Commissioner Audette is now speaking via videoconference, and giving her thanks. Bernie Poitras, one of the grandmothers to Michele Audette, is here and is now speaking. Poitras giving her thanks for getting a chance to be here: "it reminded me of home... I just want to say thanks for letting us do this work in our beautiful territory." GIfts are now being given to elders and local dignitaries and staff members. Each person receiving a gift is being announced. I won't run through all of them, as there are quite a few. 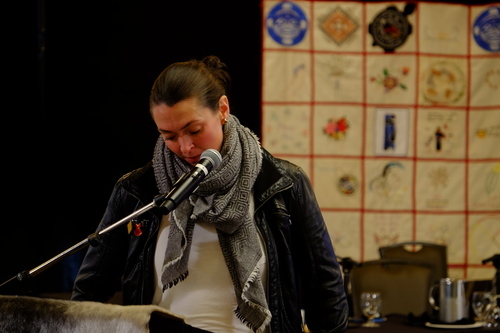 I'm still taking in the closing remarks from Qajaq. It's about as strong of a statement as I've heard from the commissioners. It's certainly the strongest words anyone's made this week. 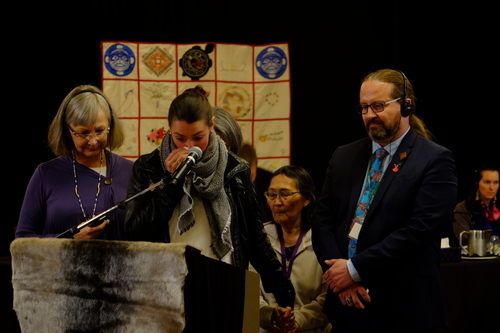 Meeka Arnakak is about to extinguish the qulliq, signifying the end of the hearings for the week. 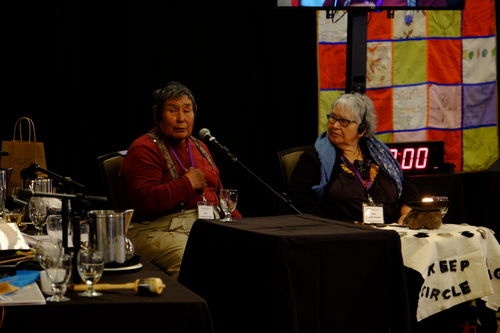 Abraham Arnakak is about to give the closing prayer. "I give this to you, because we have hope for the future." Sorry, Meeka is going to give the prayer. The qulliq is now closed, and the hearing has ended. The next set of hearings will be next week, beginning on Monday, in Quebec City. If they're anything like these, they're sure to be enlightening, difficult, and powerful. Thanks for following along with me this week. Have a great evening.